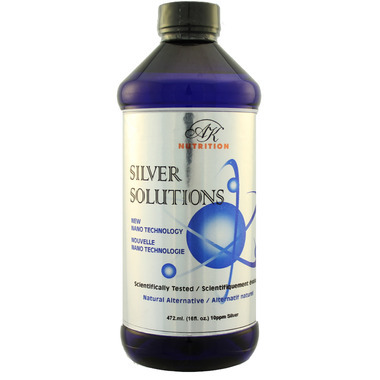 AK Nutrition Silver Solutions can support the immune system and fight against infectious diseases such as colds and flu, yeast infections, cankers and other lip and mouth sores. Engineered Nano sized particles that do not break through the water molecule, allows solution to flush out within 48 hours of consumption. Ingredients: Deionized water. Each 5ml contains 50 mcg Silver. Suggested Use: Adults - 5 to 10 ml (1-2 tsp) orally 1 to 3 times per day. Children - 1.25 to 2.5ml (1/4-1/2 tsp) orally once a day. Store at room temperature. Do not mix with chlorinated water. Warning: Consult your health care professional before use if you are pregnant, lactating, are allergic to trace minerals or if you suffer from any medical condition. Do not use with aquatic animals.